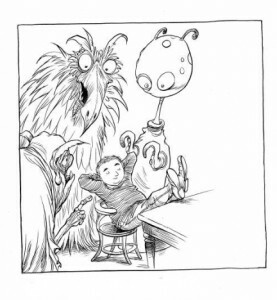 We are very pleased to announce that our 2015 Host will be the one, and only, Mr Chris Riddell! Yaaaaaaaaaaaay! Chris is an accomplished artist and political cartoonist for the Observer. He is well known for his collaborations with the author Paul Stewart on books such as Muddle Earth and the Edge Chronicles, and has also illustrated lots of picture books for younger children. Recently he has been writing and illustrating Macmillan’s award winning and captivating OTTOLINE young fiction series and the amazing GOTH GIRL. 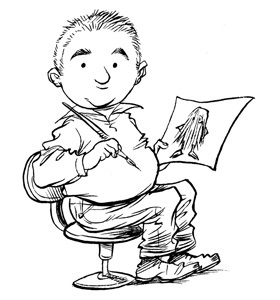 He has won many awards for his work, including the Nestlé Gold Award and the rare honour of two Kate Greenaway Medals. As well as being our fantastic host, Chris will be joining our fabulous finalist authors after the event and will be signing copies of his brilliant books. Which will be on sale on the Book Nook stand.